One of my favorite books from 2012 was Claire Legrand's debut, a middle grade horror novel entitled The Cavendish Home for Boys and Girls. I ended up following Legrand on twitter, and that is how I originally heard about The Cabinet of Curiosities website. Several authors who write middle grade speculative fiction were posting short stories as a collaborative project. They were GOOD short stories. Creepy and fantastical and haunting... all at once. I'd read them whenever I saw a link on twitter (often on my lunch break at work!). When I heard that the stories were being gathered up and published in one volume, I was delighted. And here it is, with a shiny cover and everything! 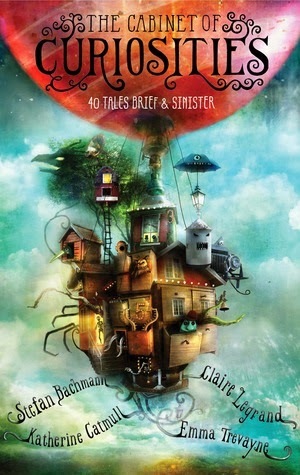 The Cabinet of Curiosities: 40 Tales Brief & Sinister by Stefan Bachmann, Katherine Catmull, Claire Legrand and Emma Trevayne will by released by Greenwillow Books (HarperCollins) on May 27, 2014. A collection of forty eerie, mysterious, intriguing, and very short short stories presented by the cabinet’s esteemed curators, otherwise known as acclaimed authors Stefan Bachmann, Katherine Catmull, Claire LeGrand, and Emma Trevayne. Perfect for fans of Alvin Schwartz and anyone who relishes a good creepy read-alone or read-aloud story. Features an introduction and commentary by the curators, and illustrations and decorations throughout. I've had this one on my radar! So many good authors, and just look at that cover!